Make your own badges using some papers, mountain tape and, last but not least, some creativity. These badges can be made for various occasions such as birthday parties or simply for fun. Start by cutting your first sheet of paper (15cm x 8cm) twice. Then cut your matching paper (10cm x 2.5cm) twice for the ribbons. Draw a 4 diameter circle on the cardboard using the compass and cut. Using the first cutting, accordion fold both paper strips with 1cm spacing. 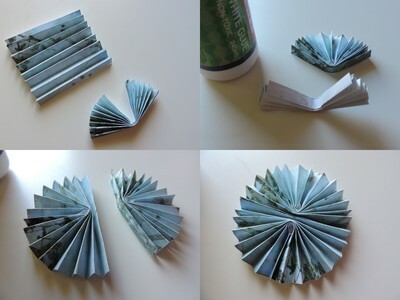 Fold each folded paper in half and glue the middle to form a semi circle. Then glue both to make a full circle. Turn over and stick a small piece of tape. Then glue the cardboard on it. Use the ribbon papers strips and glue on the piece of cardboard. Insert the safety pin in a piece of paper and glue to the back. Repeat on the other side, but instead of sticking the ribbon and safety pin, glue your stickers or any desired feature on the badge and there you have your customised paper badge. Do you mean "mounting tape"????????? That's it (or double-sided tape if you prefer). You could use glue as well but my guess is that it'll leave a more messy finish.